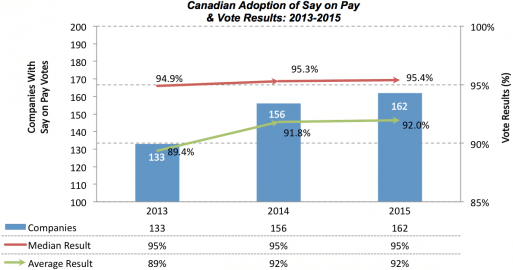 Canadian company participation in Say on Pay has increased almost 25 percent since 2013. Although Say on Pay remains voluntary in Canada, the number of companies with an advisory resolution on executive compensation continues to rise, with 162 companies holding Say on Pay votes in 2015 – up from 156 in 2014 and 133 in the year prior (a 22% increase since 2013). Participation among Canada’s largest companies continues to be strong. Approximately 80% of the S&P/TSX 60 Index and 48% of the S&P/TSX Composite companies (an increase of 7% over last year) have adopted Say on Pay. We expect that adoption rates among the S&P/TSX Composite and broader Canadian market will continue to rise, while adoption among the remaining S&P/TSX 60 companies may be slower as most of those companies that have not adopted Say on Pay are controlled or family owned companies. 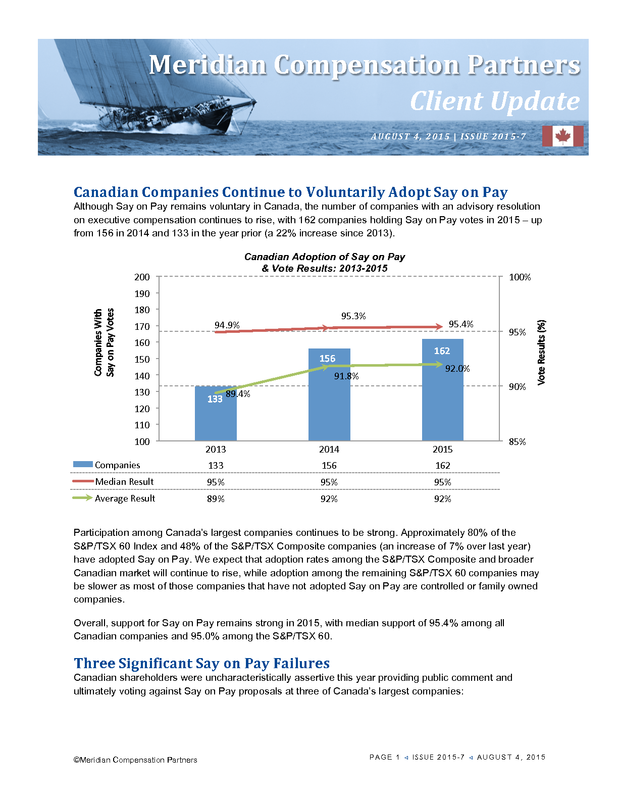 Overall, support for Say on Pay remains strong in 2015, with median support of 95.4% among all Canadian companies and 95.0% among the S&P/TSX 60. For the second time in three years, Barrick Gold failed, with 73% of shareholders voting against Say on Pay. Voters cited increases in executive chair pay and discretionary bonuses as the primary reasons for rejecting the company’s compensation plan. Barrick received considerable media attention following the “Against” vote – the company did not disclose any material changes to the planned compensation as a result of the negative reception, but Chairman John Thornton publicly stated that “[The company] will go back and refine our system, particularly as it relates to [myself]”. 57% of shareholders of the Canadian Imperial Bank of Commerce voted against the bank’s approach to executive compensation, primarily in response to post-retirement arrangements for former Chief Executive Officers. Following the negative vote outcome, outgoing board chair Charles Sirois stated that “…, we believe this year’s vote result on CIBC’s advisory resolution was significantly impacted by one specific item: the post-retirement arrangement provided to our former CEO…” – and that he did not believe the outcome was a commentary on the company’s overall approach to compensation. In a statement explaining the rationale for their vote “Against” the resolution, the Ontario Teachers’ Pension Plan stated that they “…have significant concerns with the decisions taken by [the committee] over the past year with respect to the succession planning and post-employment arrangements made with both Mr. McCaughey and Mr. Nesbitt”. At Yamana Gold, 63% of shareholders voted against Say on Pay, citing concerns with discretionary bonuses and poor disclosure around compensation decisions. In response to the negative shareholder reaction, Yamana CEO Peter Marrone announced that he would cancel a 450,000 unit PSU award that he was granted following a recent transaction. Seventy three percent (73%) of all Canadian companies with Say on Pay votes received at least 90% shareholder support, and only five percent (5%) received less than 70% shareholder support. Among the S&P/TSX 60 (shown below), 83% of companies with a Say on Pay vote received 90% or greater support in 2015 – a three-year high. In 2015, ISS recommended “Against” Say on Pay at 4.88% of Canadian companies, up slightly from 4.03% in 2014 but still down significantly compared to 2013 (6.8%). Average shareholder support in 2015 was 39.6% lower for those companies with ISS “Against” vote recommendations (25.8% lower when Barrick, CIBC and Yamana are excluded). This is a significantly greater negative correlation than the average 18.03% lower results associated with an ISS against recommendation in 2014, and reverses a previously apparent trend of lessening ISS influence. Meridian comment. While Say on Pay is voluntary in Canada, companies are increasingly adopting this good governance practice. At the same time shareholders are becoming more vocal about their concerns with compensation programs. It is more important than ever for companies to carefully design their incentive programs, to make thoughtful pay decisions and to provide strong disclosure that explains performance and pay outcomes and the alignment between them. 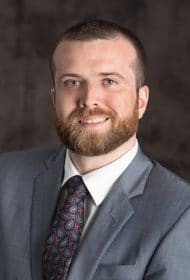 Where a company’s pay programs are different from the norm, shareholders and proxy advisors are more likely to support them if there is a very clear explanation of the program and its business or strategic rationale. In addition, more companies are engaging with key shareholders and proxy advisors in advance of the proxy season to ensure they understand and can address pay concerns, either with structural changes or with improved disclosure.